Rep. Daniel J. Fox and Sen. Mae Flexer, co-chairs of the Government Administration and Elections Committee. 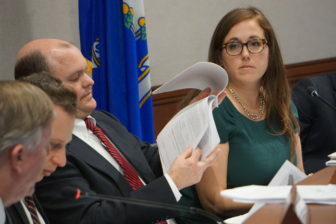 The legislative committee that oversees election laws in Connecticut finished its work Monday night, sending to the state House and Senate a broad array of bills aimed at easing voting and sharpening rules for truth in political advertising and transparency in campaign finances. In meetings Friday and Monday, the Government Administration and Elections Committee approved dozens of bills, including a measure drafted in response to President Trump’s refusal to release his tax returns in 2016. The bill would require presidential and gubernatorial candidates to release their returns for three years to get on the ballot in Connecticut. Between now and the end of the session at midnight on June 5, it will be up to House Speaker Joe Aresimowicz, D-Berlin, and Senate President Pro Tem Martin M. Looney, D-New Haven, to decide how many of those proposals will be put to a vote on the floors of the House and Senate. Both chambers have solid Democratic majorities. “I do think there’s a broad consensus on our side of the aisle around more disclosure and getting a better handle on independent expenditures in our state,” Flexer said. On a 13-2 vote, the panel approved a bill requiring disclosure in political advertising when photographs have been doctored. The bill was a response to several mailers featuring altered photos of opponents, including one that played on anti-Semitic tropes. A Republican mailer attacking Matt Lesser, who is Jewish, featured an altered image of a wide-eyed, maniacally grinning Lesser grasping hundred-dollar bills. The mailer was broadly denounced, and Lesser easily won election to the state Senate. Other Democrats were placed next to an unpopular Gov. Dannel P. Malloy in photo-shopped photos. In one case, a Republican campaign altered a photo of a Democratic legislator and his father at the lawmaker’s wedding, turning the candidate’s father into Malloy. The two dissenting votes were cast by the ranking Republicans on the committee, Sen. Rob Sampson of Wolcott and Rep. Mike France of Ledyard. The two ranking Republicans also cast the only votes against a bill sought by the State Elections Enforcement Commission to better define when an independent expenditure group is guilty of illegally coordinating with a candidate. Sampson said the bill gave too much power to the commission. Republicans also opposed a bill that would impose stringent disclosure requirements on political advertising placed on the Internet, saying the state had no authority to regulate the web. A bill proposed by Gov. Ned Lamont passed on a 10-5 party line vote. Among other things, it would designate election day as a holiday. A bill to create a commission to periodically review elections laws, including the one dictating the timing of primaries, passed unanimously.